In reality the eyes, and eye sockets, were rather darker than appear here so I (over) emphasized them. Here the eyes have been toned down slightly from the previous example. This was as far as I got by the end of the session. I don't intend to do any more although Jackie said it would be improved by darkening the clothing areas - just indicated. Overall I was fairly pleased with the session. 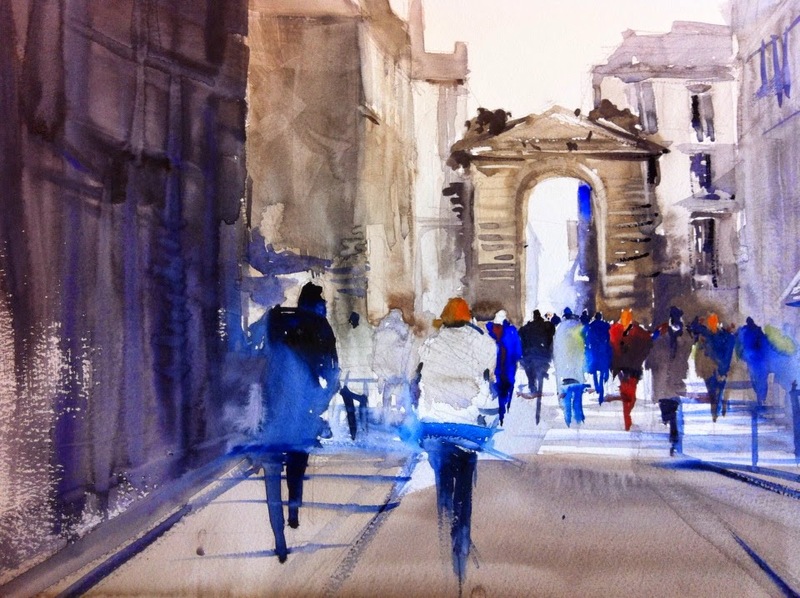 Next week is similar and I will probably bring watercolour paper and possibly experiment further. I have been reading the article by Aine Divine in the latest issue of `The Artist' (April 2015). 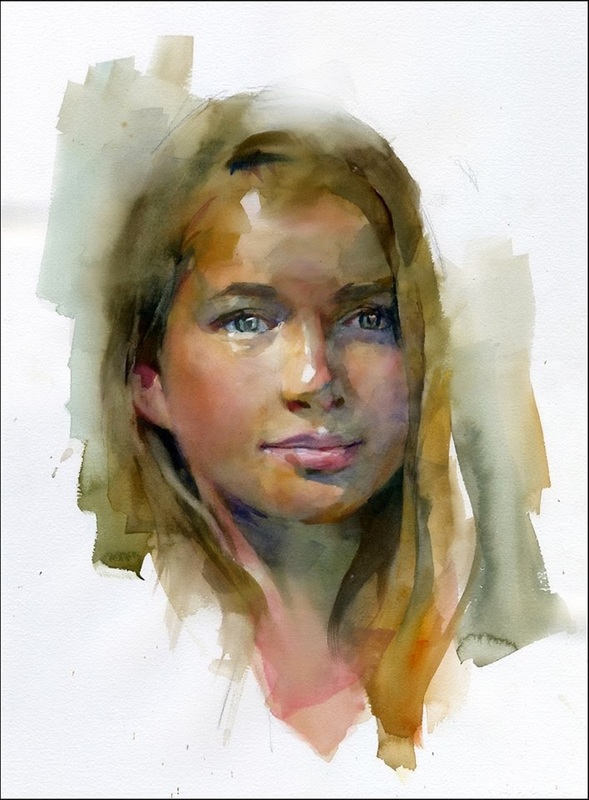 She featured in Sky Arts Portrait Artist of the Year in 2014 and was a finalist, although she didn't win, not surprising as the standard was amazing and other mediums predominated. I like most - not all - of what she does but her technique is completely different to Charles Reid, who is my guru, and I'm not really prepared at this late stage to completely change the way I do things. 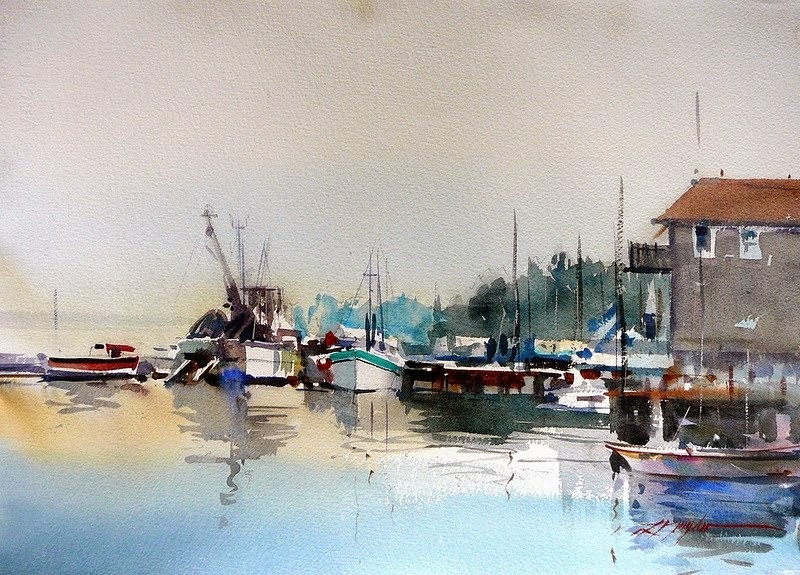 For example she uses large flats, including cheap brushes and paints on 535gsm Bockingford Not. 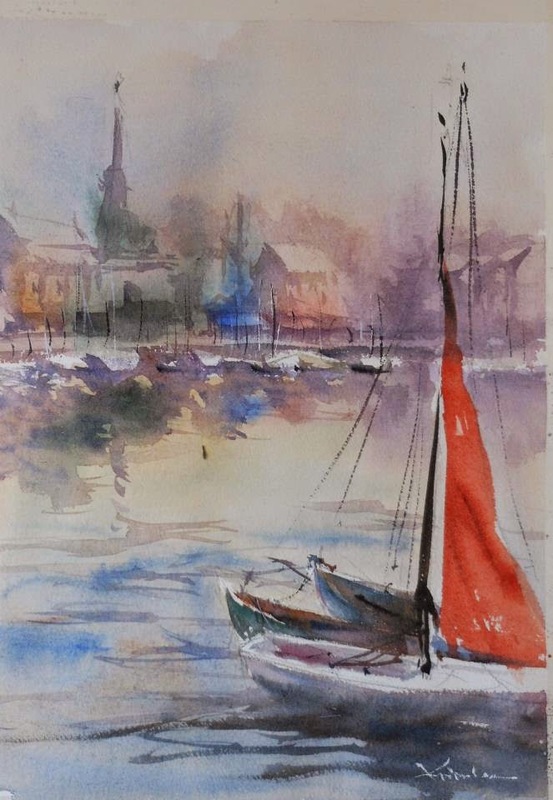 She uses many colours with Ultramarine Blue predominant with Alizarin Crimson, Cadmium Red, Cadmium Orange and two greens amongst others with lots of layering. This was the subject at this weeks AVA session. Only 8 members were present but as I forgot my camera (again!) I wasn't able to record those who were there. Not having been the previous week I was wondering how this subject might be interpreted. `Googling' Moody Blues just produced masses of images of the well-known pop group, so I was in something of a quandary. In the event the usual flexibility was in place so I decided to do an Indian portrait in just blue colours. These were Turquoise (Lukas PB16), Cerulean, Ultramarine Blue, a little Cobalt Blue. I also darkened the Ultramarine slightly with Burnt Umber. Brave Buffalo, a Sioux Medicine Man, claimed he was able to deflect bullets using his `magic ' powers. Several indian prophets arose in various tribes claiming similar magical powers, but all were found wanting. 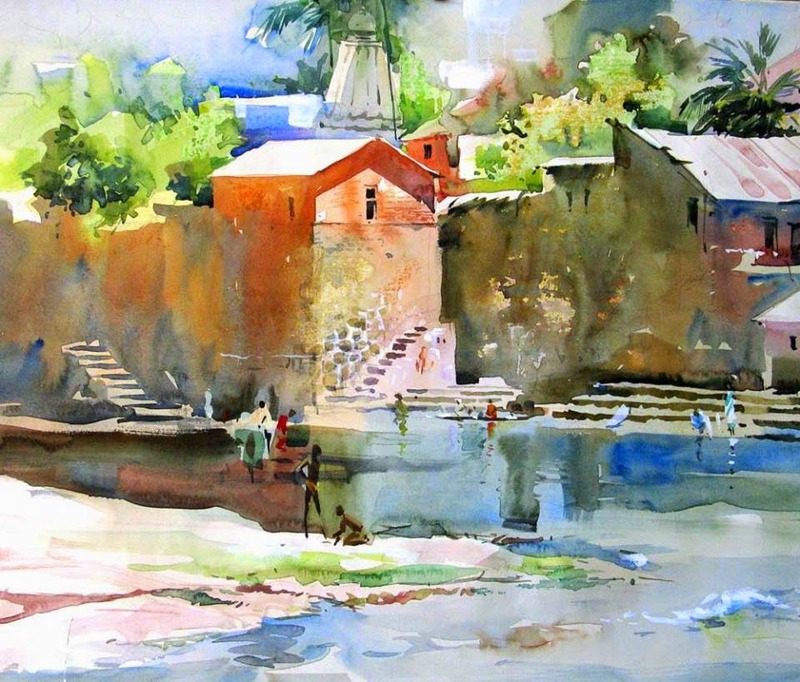 This mostly arose because of the Indian despair at the encroachment of the white man, and realisation the Indian way of life was fast disappearing. I had no idea how it would turn out with no pre-planning whatsoever. Actually when I arrived at the session I had no idea what to do. After seeking clarification I decided on my old staple an Indian portrait. I did a basic drawing, using a photo on my ipad as a reference drawing from the inside out by starting on the eyes then the nose and mouth before working outwards. My Pentel mechanical pencil 07 2B was the drawing tool. I then painted starting with the eyes. 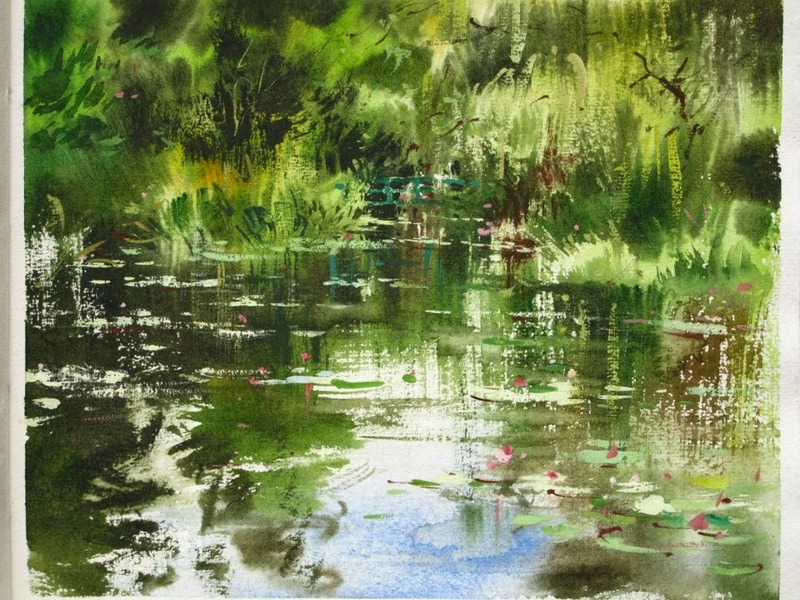 I used three brushes, the Isabey retractable No. 6, Rosemary Retractable Kolinsky sable Size 6 and an Escoda retractable Size 10. As I've mentioned before the Isabey, while long and slim and a lovely brush, is smaller then a normal size 6. I've no idea how this will go down but rather like it. known artists. Please note regularly updated Index to blog posts see July 2014. I hope you have enjoyed this selection and more will follow in due course. 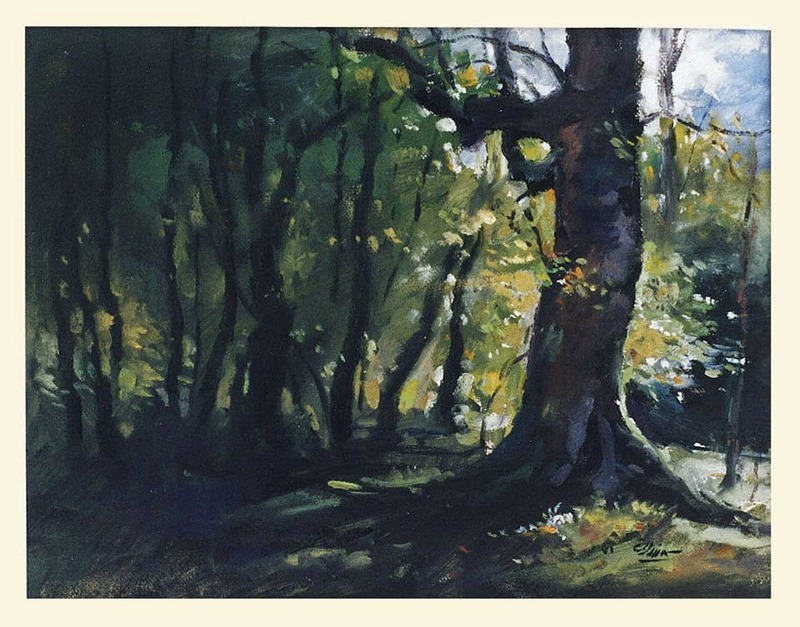 Recently one of my painting friends and senior member of Avon Valley Artists - Yvonne Harry - has been engaged in an exchange of e-mails with Daniel Smith over the DS version of Indian Yellow. Essentially Yvonnes complaint was that the colour was simply not recognisable as Indian Yellow as understood by artists. To give a little background it was originally, so we are told, produced in India in a revolting manner, cows being fed a particular type of leaf to produce a highly pigmented yellow cow dung from which the paint was extracted. I have since read that this story is questionable but has been repeated time and again. As in other cases where the natural pigment became unavailable, or was ruled out on various other grounds, the paint manufacturers have produced alternatives under the same name. 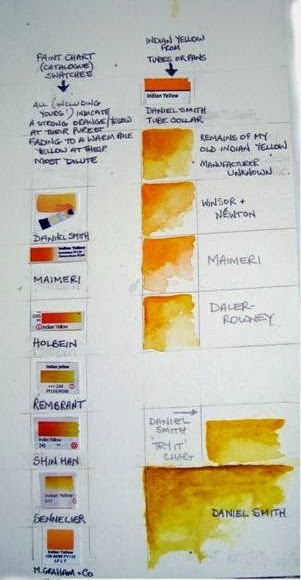 This then becomes complicated when there is no unanimity on what pigments to use. With regard to `Indian Yellow' the most popular pigment seems to have been PY153, although Winsor & Newton called its PY153 paint `New Gamboge'. The above swatches are from Yvonne and illustrate what she means about the colour being `off key' for want of a better description. I don't have the DS version being very happy with the much cheaper Daler Rowney version, which is PY153 until they run out. I have managed to buy a number of tubes so they should last a while! Indian Yellow, as sold by all other makers is on the orange side of yellow - a deep yellow in other words - whereas the DS version seems - to my eyes from the `Try -it' colour sheet - more inclined to a muddy orange. It is PY108 a different pigment to other makers. I realise that personal preference is a factor here and other views may differ. 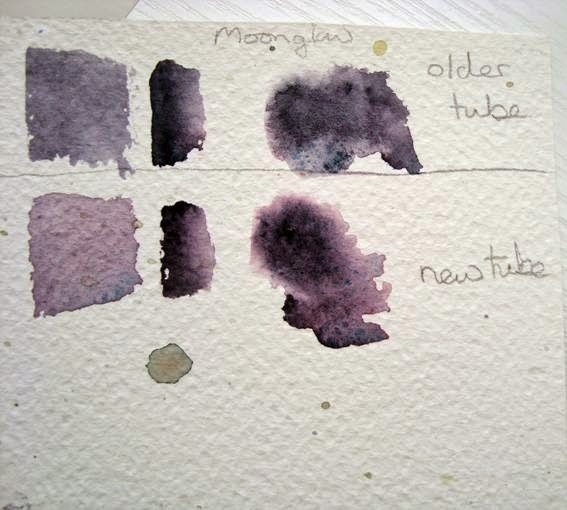 The plot thickens when another of the AVA senior artists, Jan Weeks, reported that her latest tube of `Moonglow' was a different shade to the previous one. Jan is a very experienced and talented artist so she cannot be easily dismissed. Different shades? What do you think? 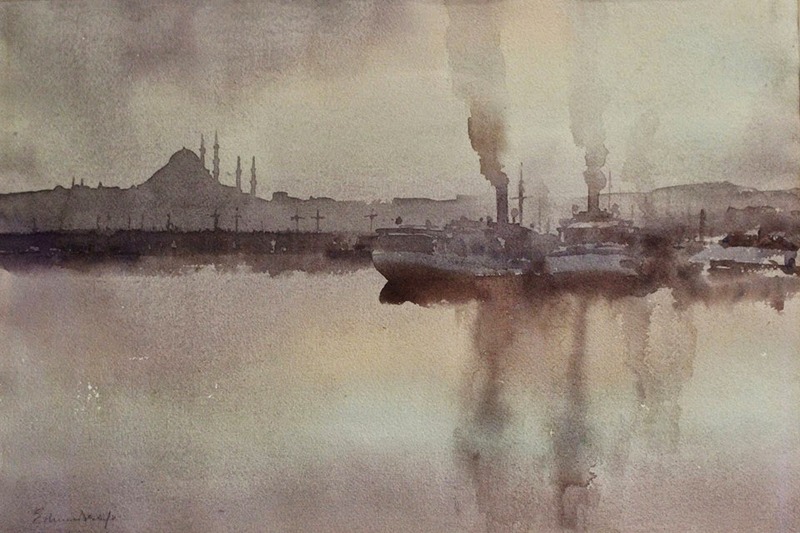 `Moonglow' is a mixed pigment paint PG18/ PB29/PR177. A green, blue and red combination. Despite being a three pigment mix it has become a favourite of many. Yvonne was initially very annoyed at the response from Daniel Smith, which was rather patronising, but she is a determined lady and after further correspondence that changed. In fact she has now received three 15ml tubes, Serpentine Green, Bordeaux and Carbazole Violet FOC as a peace offering and all is now well, although her opinion of Indian Yellow remains. She gave me a `sqeeze' of all these colours and they are lovely. I think I should emphasize this isn't a general criticism of Daniel Smith paints. There is universal agreement they are excellent and handle beautifully, if somewhat expensive in Europe. The range is huge and there are so many tempting colours that are hard to resist, the inclination is to buy colours you don't really need. I've done it but then face the problem of how to use them. Artists palettes vary in size but I would think the majority are in the 12 - 24 range. 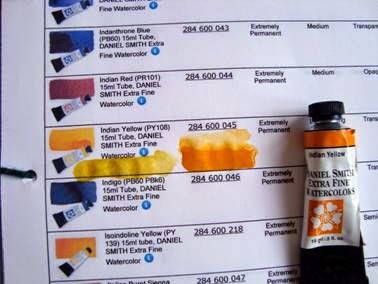 Daniel Smith produce well over 200 colours and do you really need up to 20 reds, 20 yellows etc? All it does is confuse the issue of what to buy. I think the Primateks are a different matter and would refer to the piece Bruce McEvoy of Handprint wrote about them some time ago. I do have one issue with Daniel Smith though. Sometime ago I read they had developed a method of making multi pigment paints behave as though they were a single pigment. This has implications when mixing with other colours.This applied to the Cadmiums where a `hue' equivalent was offered. I e-mailed them and enquired whether they did the same thing with other mixed pigment paints. I received no reply and a second e-mail also went unanswered. This week the medium was charcoal and we had a new model. The idea was you crushed a piece of charcoal into powder and initially worked the portrait with your fingers. Then add detail with small pieces of charcoal of various shapes, sharp, blunt etc, depending on what was needed. The putty rubber also came into play erasing and creating whites. During the session Jackie quietly drifted around - you suddenly find her at your elbow - pointing out errors and suggesting ways of improving things. This is very effective and not at all negative. This was quite an enjoyable exercise, although I wouldn't do it by choice! Charcoal is very messy but also expressive. The idea once again is to avoid `tightness' and repetition in your drawing/painting with Jackie again stressing there is no one way of drawing. To illustrate this she had a book of Matisses drawings which clearly showed him drawing in many different ways, as well as examples of her own very good work. Next week we are using pastels, something new to me. Last weeks theme was `Reflections' which once again gives considerable scope. We had twelve members present and a varied selection of paintings resulted. 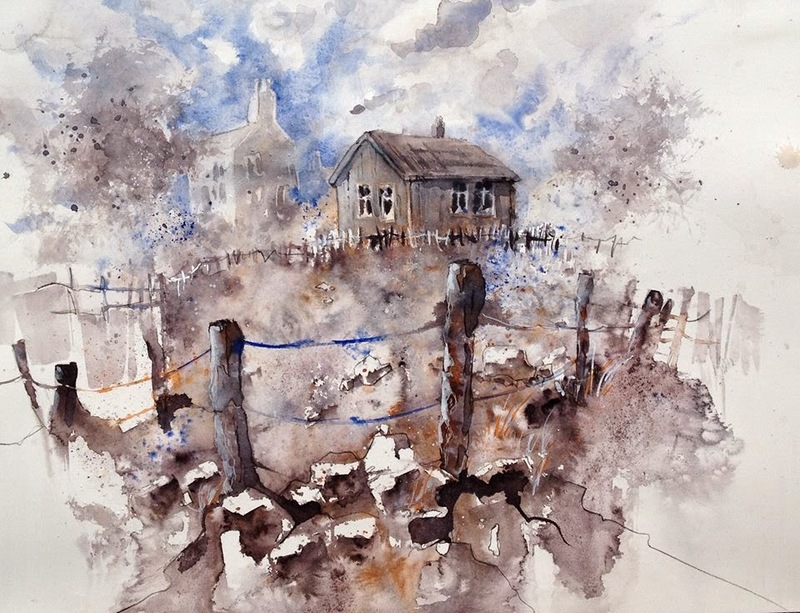 Jan Weeks - an interesting theme with nine similar pieces linked together. This is Yvonne Harry. 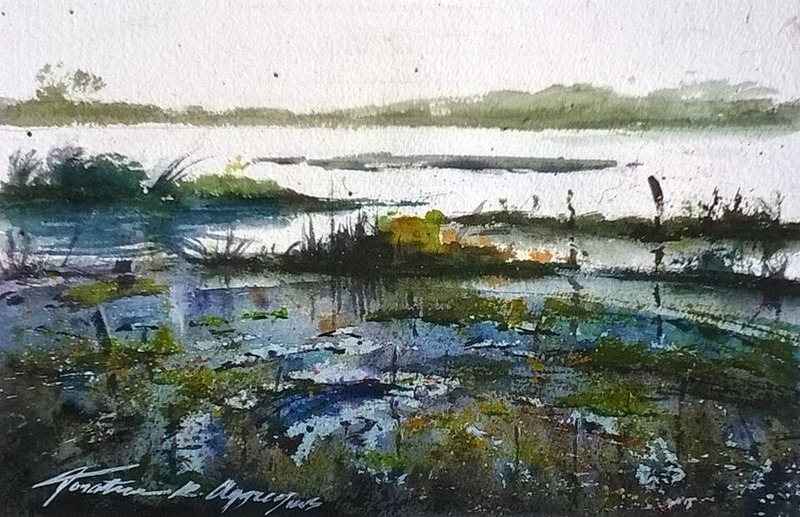 Yvonne paints flat and is using Andalucia paper here. A closer view of this unfinished (and complicated) painting. It aroused great interest. The finished one should appear on her blog . The above three photographs illustrate the complete set of paintings and shows the various sizes. Next week is `Portraits/Figures' using own references as unfortunately we seem to have ongoing difficulties in getting a live model. I've offered to pose but my fellow artists don't seem too keen! Labels: Avon Valley Artists, Reflections. This was the second week of the course and was more demanding. 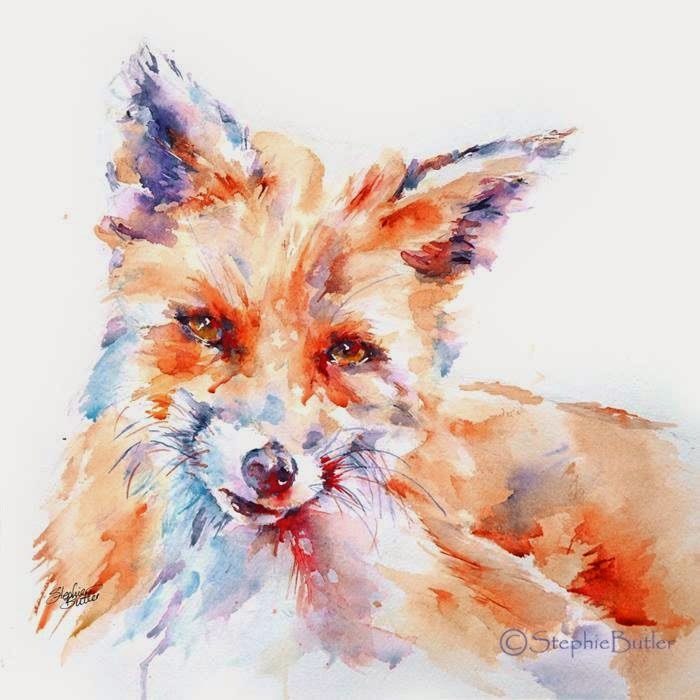 Jackie spoke to us first regarding what she wanted us to do, the overall purpose being to adopt a more relaxed, more impressionistic and less formulaic approach, something many artists slip into - their comfort zone. The session was broken into four distinct parts using different drawing mediums, fine liners, graphite sticks, charcoal and drawing ink. We were told we shouldn't take more than ten minutes or so for each study but invariably they took longer. This drawing was with a graphite stick and one of the things we were required to do was move to another easel - two places - after each session so the angle of the model was different. From this you can see I got the front profile of the features wrong and had to the redo them but was unable to erase the earlier marks. Ocado Drawing ink applied with a sharp stick, one end chisel edged the other pointed. I rather enjoyed this even though it created a `black' result. Sight unseen drawings. I was reluctant to put the above two drawings on here but warts and all! This was actually the third task and we had to place our body and head slightly in front of the paper and easel. We weren't allowed to look at the paper and were asked to draw a continuous line! In effect your head was slightly ahead of the easel with your drawing arm hooked round onto the paper, while all the time looking at the model.. Jackie showed us several examples of where she had made drawings using this method and they were universally excellent even if each somewhat different. I found this very difficult as the above examples show. I wouldn't say most of the other (9 this week) were a lot better, although some were. Where comments were made about mine Picasso was mentioned but I fail to see that connection - rather just a mess. As mentioned earlier we were supposed to take not much more than ten minutes on each but they still filled a two and a half hour session, even with a thirty minute break! I think it fair to say that everyone on the course is enjoying it. I did this course two or so years ago and it has moved on to some degree.